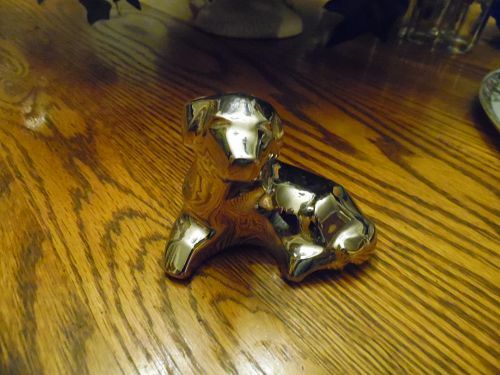 Awesome Dansk silver plated dog paperweight. Very heavy. Measures 2 q/2" tall and is 3 1/2" long. Looks like a lab of some kind. Excellent condition. 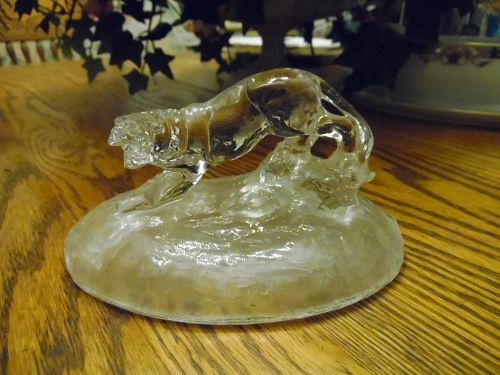 Crystal big cat,cougar,mountain lion Figurine Cristal d'Arques Clear Glass wildlife Cabin Decor Cristal D'Arques France, Lead Crystal. Frosted, Hollow Glass Base Measures 3" tall, 4" wide, and 6" long. This company makes many different figurines but Hard to find this one. Perfect condition but no box. Please send zip code when inquiring or purchasing so I can give an accurate shipping. 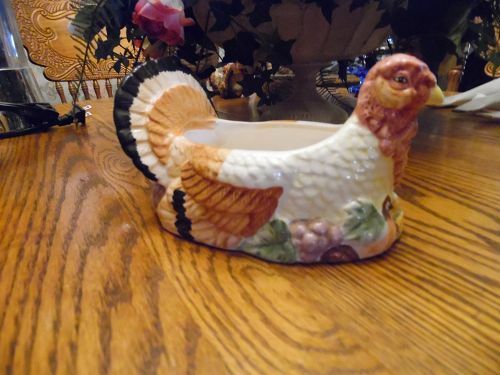 Ceramic turkey dish would be great for serving relishes or could be used as a centerpiece for your table with some fall foliage added to use as a vase. Perfect condition. hand painted and glazed over decoration. Measures 4" tall and 7" long. 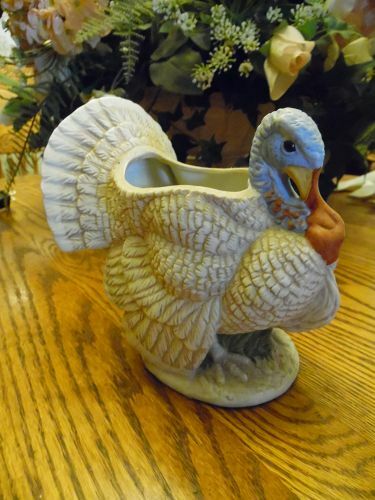 Nice bisque porcelain turkey. Open back (Not intended for a lid) Fine porcelain made in Mexico with the ink number 3560 on the bottom. Measures 5 7/8" tall. Would make a nice centerpiece vase, hold silverware, or something else creative for Thanksgiving decor. No chips or damages. Fitz and Floyd covered turkey basket. Marked Fitz and Floyd 1983 and has the paper sticker too. 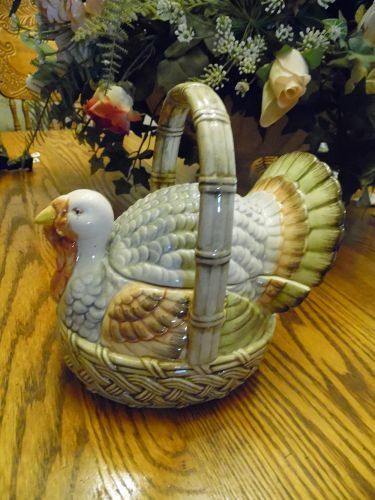 Figural turkey sitting on a basket, Measures 7 1/2" to the top of the handle. Made of glazed ceramic and in perfect condition. Nice for Thanksgiving. 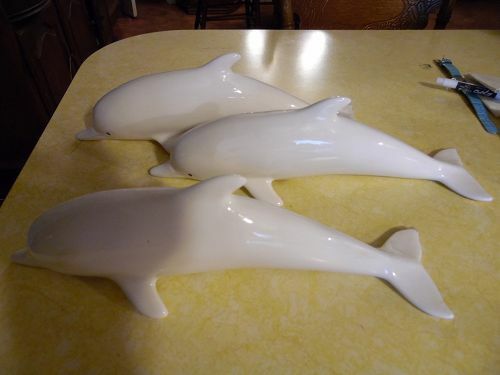 Three ceramic dolphins for hanging on the wall. Each dolphin measures 12 1/2" long. Two are perfect but third has a long crack on the belly area that could be comoflaged with white ceramic paint. Not so noticeable when hung up. So I'm actually selling the nice pair and throwing in the 3rd one at no charge,These would look great in your beach house bathroom. Great ocean decor. 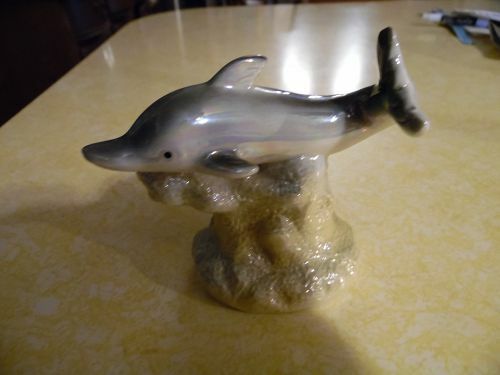 Cute dolphin and coral figurine measures 4 1/2" tall and the dolphin has an irridescent lustre finish. Made of heavy porcelain which would make it ideal for a fish tank or aquarium. Perfect like new condition. Or use as a figurine to add to your ocean or beach themed collection. Check out all of the other whale and dolphin items I will be listing from a large private collection. 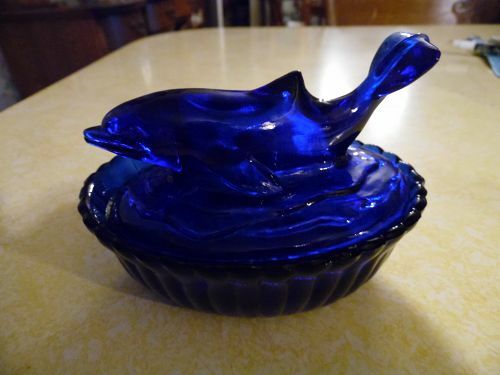 Lovely cobalt blue dolphin lid candy or trinket dish measures 6"Long 4 1/2"W and 4" to the tip of his tail in height. Wonderful condition with no damages. This is like the hen on the nest candy dishes only a dolphin. 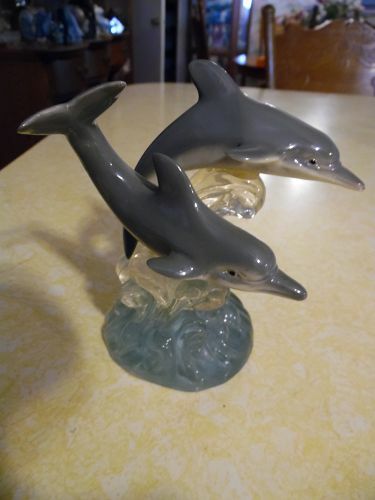 Fine Porcelain figurine of three dolphins. 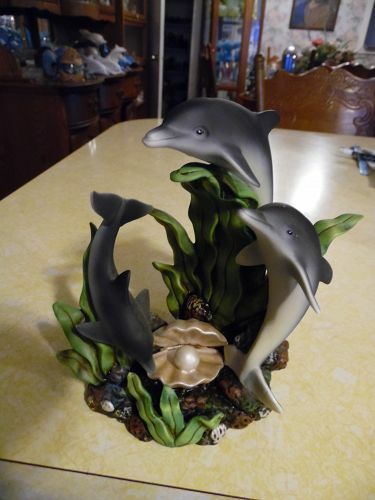 Beautiful figurine of three dolphins in a scene showing the ocean floor, coral, seaweed, and a pretty shell. In excellent condition - no chips or scratches. Approximately 6 1/2" tall A wonderful addition to your ocean or beach theme collection. 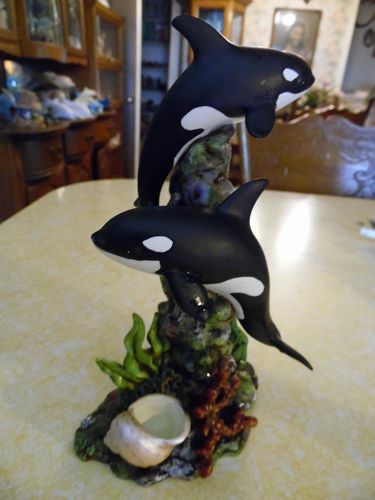 Fine Porcelain figurine of two Orca killer whales. 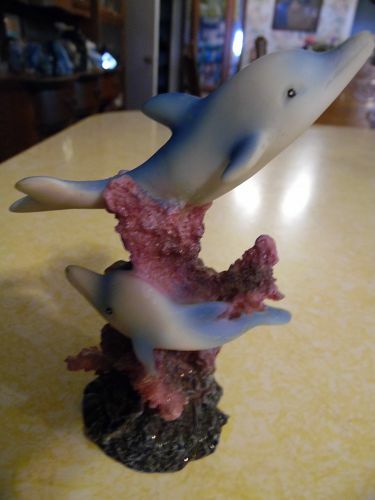 Beautiful figurine of two whales in a scene showing the ocean floor, coral and a pretty shell. In excellent condition - no chips or scratches. Approximately 9" tall.A wonderful addition to your ocean or beach theme collection. Pretty trio of dolphins porcelain figurine with a blue lustre finish. This is possibly a fish tank ornament due to its heavier weight. Measures 4 1/8" tall. Perfect condition. Great addition for your beach or ocean themed collection too. 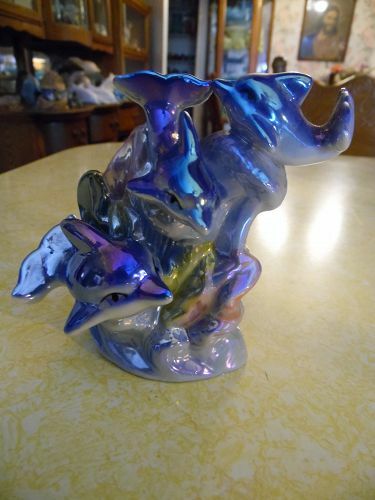 See all of the other dolphin and whale items I will be listing from a large collection. Pretty dolphin figurine made of bisque porcelain and measures 8" tall. Perfect condition with no damages. Awesome addition to your ocean or beach theme decor. 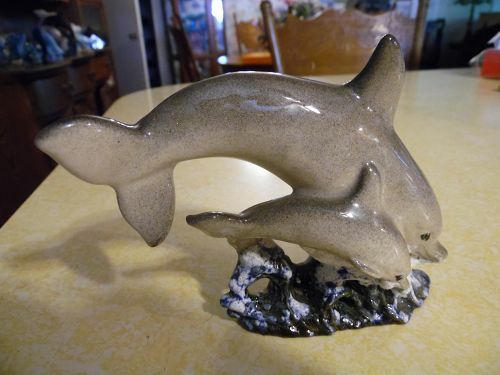 See the many other dolphin and whale items I will be listing from a private collection. 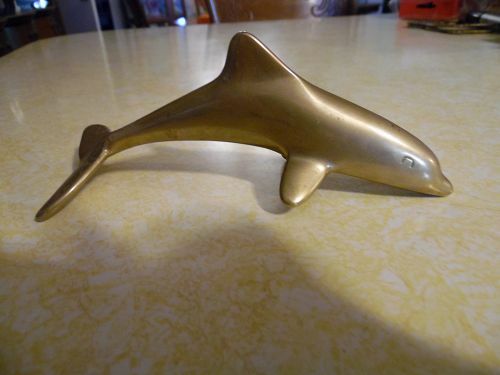 Solid brass heavy dolphin figurine that may have been intended for a paperweight. Measures 6 1/4" long and 2 1/2" tall. Great condition, just needs a little polishing if you want it shiny. Great for an ocean or beach themed area. See other dolphin and whales I am listing from a private collection. 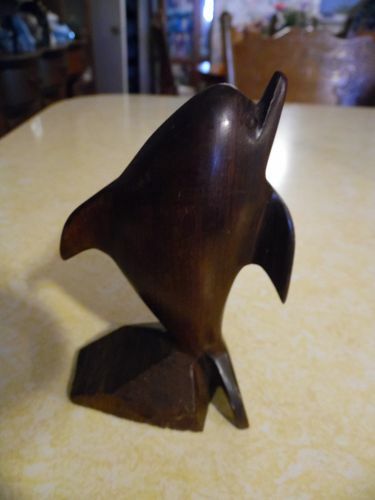 Vintage wood dolphin figurine, teak? Hand carved wood dolphin figurine. Not sure what kind of wood, but is smooth and heavy. Measures 5 1/2" tall. No damages or scratches. See other dolphin items I will be listing from a private collection. 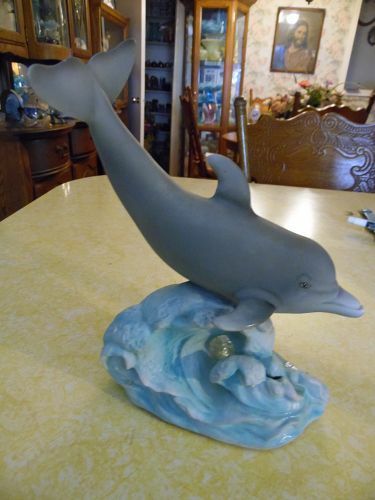 Beautiful dolphin duo on ocean waves, figurine. Made of resin cast, and the dolphins seem very realistic looking. Measures 5 3/4" tall and is in perfect condition. Has only been displayed in a collection previously. 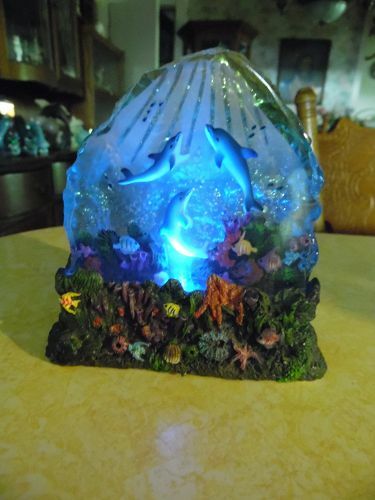 See other dolphin, whale, beach and ocean related items I will be listing in the catalog. Hand painted figurine of a mamma dolphin and her baby jumping the ocean waves, made of glazed ceramic and measuring 4 5/8" tall and 6 " long. Perfect condition. Add this to your beach themed decor. See other dolphins and whales I am currently listing from a large private collection.